“This is my best work I have done so far. This time, I wanted to practice background and painting technique. First impression: The colors and the flowers! Really beautiful! What do you like about this image? The garden especially. The roses have great detail in them. The colors used in the person also add a nice contrast to the background. The hair also looks especially gorgeous. I like that is has both the detail of smaller threads and the clumps of hair that make it more realistic. Is there something you don’t like? The only thing I could find was the edge of the path to the garden. The stones have a hard stop/edge which makes it look like a rug instead of path. Overall great pic!. The only thing I would suggest pushing further is fading the background into that white light a bit more to give a little more depth. Ok, so when I first saw this it really reminded me of a manga cover. I really like the composition of this piece and the mystery of where this person is and where they are going. Whats at the end of the roses? 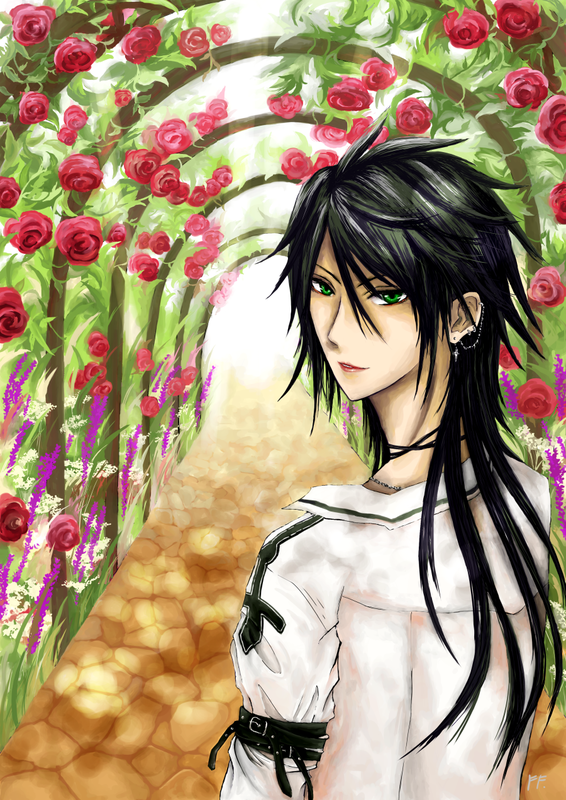 the hair and the roes are done really well and I see a lot of effort put into the entire picture at a glance. I love the light shining through on the stone pathway. After looking at the picture for a few moments I noticed where the path and the hedge/arc connects is very straight. I am not really sure if the plants are growing through the path or if there is an edge. I have to agree with Antumbra that it reminds me more of a rug then something solid or natural. About where the path and the plants connect, I think that if there were some leaves, grass or even a bit of dirt overlapping onto the path it would look more realistic (small grass leaves falling on to the path?). I might even suggest adding a small shadow to create a lip where they connect. I love all the details on the flowers but the purple ones look a little flat. Maybe just adding a little bit of dark purple would help them stand out a little more. (maybe something as simple as using a speckle or a dissolve brush).